Humans have been recording ideas from the beginning of time. The tools used to share ideas have also evolved along the way. We have gone from blowing paint onto cave walls, using a hammer and chisel to record ideas on tablets, to using brushes to paint hieroglyphics on pyramid walls. Fast forward to current times and we have an abundance of tools both analog and digital to help us get our ideas out and to share with the world. Having an abundance of tools also brings confusion about where to begin. Has this ever happened to you? You to buy a sketchbook with grandiose plans of filling each page as soon as you can. When it’s time to draw, you open the sketchbook and stare at the blank page. The fear of filling a blank page freezes you for hours, which turn into days, weeks, and months. Add to that the different kinds pencils, pens, and markers available in the market today. We don’t have to buy new tools to start sketching. The excuse to only start after we have all our tools is our way of procrastinating from doing the work. Once we realize this, we are able to focus our efforts on sketching and away from the next shiny tool that comes along the way to distract us. For those who are just starting out with sketching or are looking to get back into sketching I suggest just two tools a pen and paper. That is all you need to start sketching right now. You don’t even need to buy a new pen or paper because most likely you already have those available to you already. Yes, it’s really that easy. Why am I suggesting a pen and not a pencil when sketching? 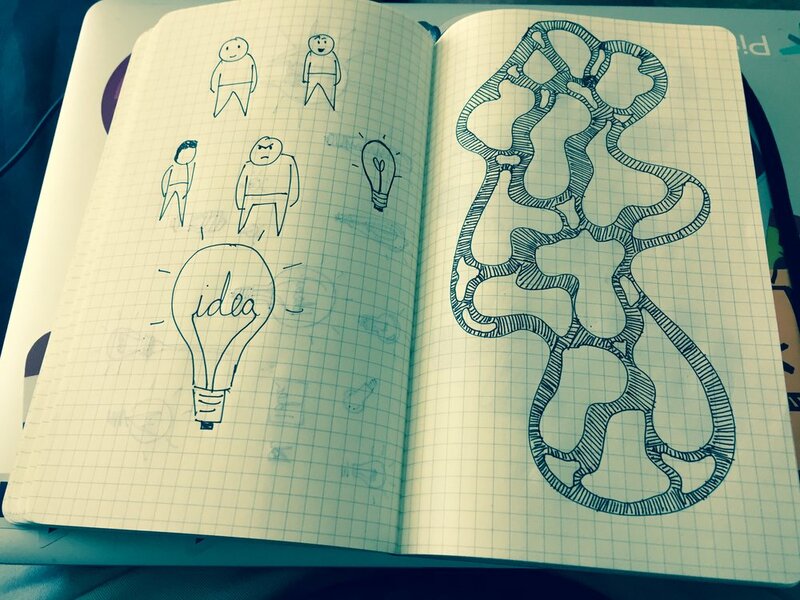 By using a pen you will start to trust your strokes to let the ideas out of your head quickly. By using a pencil we can fall into the trap of creating an illustration and going for perfection. The tendency to erase will be great as well. That’s why it’s a good idea to start off by using a pen to sketch. There is definitely a time and place for using a pencil to sketch. For example, when sketching a UI you need to get placement and the labels right especially after getting feedback. Even though there are many tools to pick from when sketching, it is important to keep it simple when you’re starting out. This will help you stay focused on the activity of sketching and not get distracted. Let’s face it, no one ever looked at sketches and admired the tools used to create it. “Wow! You must have used an expensive pen to create those sketches.” said no one ever. I realize that the option of two tools only does sound limiting but there are many varieties within those options you can experiment with. Start off with whatever pen and paper you have available to you. Once you are ready, you can experiment with different types of tools within those categories. Take your time and try out different variations of pens and paper. Since you will be sketching every day it is good to find the combination that works for you. In the pen category, I love the Pentel EnerGel Euro Needle-Point 0.5mm. The grip and feel of the pen are great. The nib is smooth and the ink flows out smoothly. Plus the ink dries quickly as you write or sketch. The cap makes a nice snap sound when taking off and putting the cap back. This provides an audible cue to let the ideas flow. The Pentel Energy Euro is also available in black, blue, and red ink colors. This pen is also available in these tip sizes: 0.35mm, 0.5mm, 0.7mm, and 1.0mm. In the sketchbook category, I recommend the Moleskine Squared Notebook - Large. 5" x 8.25" - 5 mm Graph (Wondering how you pronounce it?) This notebook is the perfect size to carry throughout the day. Whether you are at your desk, in a meeting, or at home. By carrying it with you, you can make sure you don’t loose any ideas. This notebook has a sewn binding which make it easy to lay flat on the table. The paper itself is great to use with the Pentel EnerGel Euro Needle-Point pen since it doesn’t bleed through. Sharpies, on the other hand, will definitely mark the next few pages. Experiment with a different type of pens and sketchbooks to find what works for you but don’t let this become a reason to procrastinate. Keep sketching and honing your skills to get better and harness the power of sketching. Start sketching right now, not tomorrow or when you get your brand new sketchbook and pen delivered in the mail. Grab the tools you have available and just start sketching. Which tools do you love to use for sketching? Share them in the comments below.